1. This drill establishes how the sand wedge should really work. Stand in a practice bunker without a ball. Adopt your normal bunker stance and take several swings down into the sand. The object is to get the feel of the club dragging through the sand, not digging into it. After a dozen shots, try hitting a ball. Pick out a spot where you want the ball to land and then go for it. Repeat the exercise until you're comfortable with the feel of the wedge splashing through the sand. 2. The two lines drill eliminates the tendency to lose focus during the shot. Stand in a bunker and take your normal bunker stance. Now draw two lines in the sand, about six or seven inches apart. The lines represent the length of the sand you should carve from under the ball. Line up several balls between the two lines, and then hit them. The club should enter the sand where the first line is and emerge where the second line is. Practicing these two exercises builds better bunker technique. As you improve your technique, you'll increase your confidence in the shot. 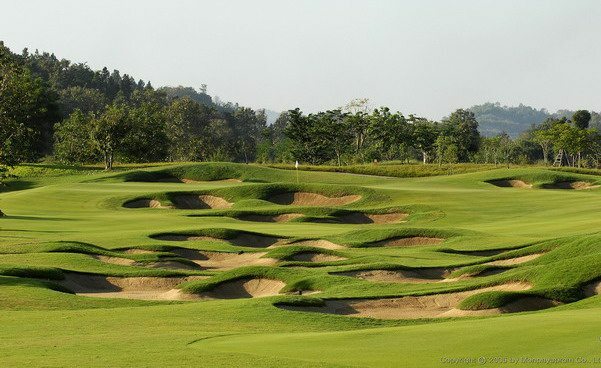 And confidence leads to better sand shots and more fun when golfing in Thailand.